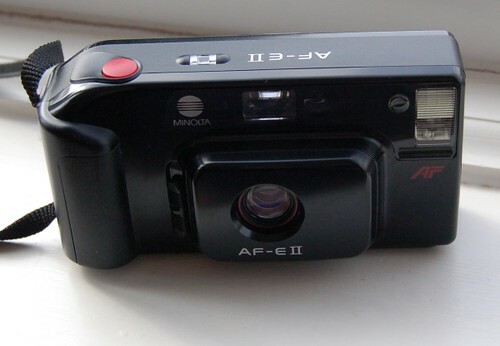 Minolta AF-E II (called Freedom 200 in America) is an autofocus compact camera and a simplified successor model to the original AF-E. It has motor drive, built-in flash and runs on either a photolithium battery or common AA batteries. It uses DX-coded films, but only at ISO 100 or ISO 400. It served as the basis for both the fix-focus FS-E II and the all-weather AF-SP. Lens: 35 mm f/4,5 (4 elements/4 groups). Focus: Infrared [autofocus] from 0,95 m to infinity. Flash: Built-in, automatically activated with ready-light in finder. Shutter locked while recharging. Flash range (at ISO 100): 0,95—3,3 m.
Metering: EV 9,6–16,2 with ISO 100 film. Narrow metering angle. Crippled DX decoding; either ISO 100 or ISO 400. Non-DX films are exposed as ISO 100. Film transport: Automatic loading, advance and rewind. Power: 1 x 6 V DL223A/BR-P2N lithium battery or 4 x 1,5 V AAA alkaline batteries. Dimensions: 132 x 69,5 x 48 mm. Weight: 250 g without batteries. This page was last edited on 9 October 2015, at 05:02.